The resultant ‘Parole Denied’ (issued on Frontiers Records in 2018) seems surprisingly glossy at first. From the opening bars of ‘Ohaya Tokyo’, Bonnet’s vocals aside, things sound incredibly well balanced for a live recording. Waldo’s keys, especially, appear nice and high in a beefy mix, and rather unexpectedly, the vocals don’t actually swamp everything. Moving into the bombastic ‘Too Young To Die, Too Drunk To Live’, the live aspects of the recording become more apparent, since Bonnet occasionally sounds a little lost behind Conrado Pesinato’s guitars and Shea’s bass, which appears to be pushed forward in the end mix. In some ways, making a bigger feature of Shea’s contributions is very much the right thing to do, since without him, it’d just be a Bonnet Band performance of Alcatrazz songs. Pesinado is no Malmsteen, but nevertheless, when it comes to the overtly complex solo, he gives everything his all. On the slower ‘Suffer Me’, Bonnet over-sings everything, but Alcatrazz were never known for their subtlety, while the more spacious arrangement allows time enough to appreciate what a fine live recording this is. There may have been some smoothing out in post production, as is the way with most official live releases, but the full and booming sound at least gives half an impression of a hard working band. The amount of bottom end on the recording almost renders most of Conrado’s lead guitar work inaudible during the set highlight ‘God Blessed Video’, but the finer points of the performance were always going to take backseat. By now, any misgivings about too smooth a live recording can be forgotten, since this is all bass, drums and bombastic glee. Bonnet, in particular, is in great shape – even when reaching for the more forceful sounds, he’s a thousand times better than his early 90s self on the Blackthorne live recordings. Moving into ‘Jet To Jet’, Mark Benquechea’s drum pedals blast through everything in sight, firmly pushing the needle into the red on the intro and chorus sections, but he pulls back during the verses just enough to expose a really energetic vocal from Bonnet. The highlight of this particular track, though, comes from Pesinato as he powers through his own take on a great solo at a thousand notes a second. Alcatrazz sounded bombastic in the 80s, but this shows that time has not diminished the sense of force within their best material. Slowing down once more for a late-period number, ‘Witchwood’ casts aside the anger and gives Bonnet chance to shine on something bluesy, backed admirably by Jimmy Waldo’s squirly keyboards. Here, Alcatrazz put in another of this particular live sets finest performances, leaving behind a feeling that 1986’s ‘Dangerous Games’ remains one of the era’s most criminally ignored albums. The closing double whammy of ‘Hiroshima Mon Amour’ and ‘Island In The Sun’ offers two of the debut’s best tracks, ending the show in a more melodic place. 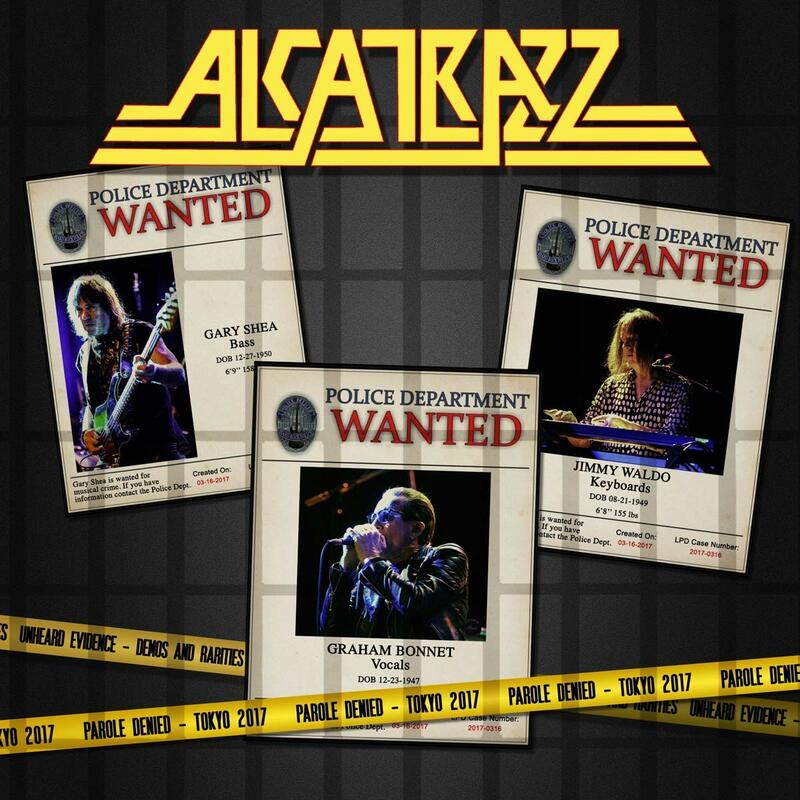 Between Waldo’s unashamedly 80s keys, Conrado’s dirty guitar lines and Bonnet in full scale wail, it’s almost like Alcatrazz never went away. For those hoping to add something more authentic to their collection, a selection of bonus tracks feature various period recordings with Alcatrazz’s second – and arguably most celebrated – guitarist, Mr. Steve Vai. For the bigger fan, six previously unreleased recordings showing the evolution of 1985’s ‘Disturbing The Peace’ are a must-have, especially since they comprise various numbers which didn’t make the final release. ‘Blue Boar’ will be familiar to most fans; in this early state, it sounds pretty rough but between Vai’s distinctive approach to the guitar and a huge chorus, it’s clear there’s a great song waiting to be let loose, while the rockier ‘Ohayo Tokyo’ is almost equally fully formed. Both tracks eventually turned out well with Danny Johnson during the recording of ‘Dangerous Games’, but measured against the remainder of the Vai sessions, it’s perhaps obvious why they were left on the shelf. They’re interesting listens, but just not ready at the sessions captured here. Best of all is the previously unheard ‘Emotion’. A huge 80s ballad, on the recording in question, Graham mightn’t be in the most perfect voice and rhythmically, the drums seem to be set to mid-pace (maybe extra flourishes would’ve come later? ), but Vai is in fantastic shape. Throwing out beautiful soaring sounds throughout, it’s possible to pick up on a style that would give him a solo breakthrough in the early 90s with the ‘Passion & Warfare’ album. Keen eared listeners might even spot a couple of parallels between this and solos that eventually took pride of place on ‘For The Love of God’. Just lovely. ‘Parole Denied’ is an interesting set. Bringing together the past and the present, it aims to be all things to all fans – and mostly succeeds. Sure, the live recording might not be the most balanced in terms of audio, but it sounds like Thin Lizzy’s ‘Live And Dangerous’ compared to the three shows in Cherry Red’s almost concurrent ‘Official Bootleg’ release, while the unreleased demos are certain to be welcomed by most. Regardless of line-up, irrespective of audio quality, if you’re an Alcatrazz or Bonnet fan, you need to snap this up. Read a review of the Alcatrazz Official Bootleg Box 1983-1986 here. This entry was posted in Album & EP Reviews and tagged alcatrazz, frontiers records, graham bonnet, metal, rock, steve vai by Real Gone. Bookmark the permalink.